The society is dead and has not enough vitality left to get up a respectable funeral. Sunday School closed with the Christmas exercises, and has not reopened. Nor has the church been used for divine service since that time. There has been quite an awakening from the Rib Van Winkle sleep of the society, and some young blood has been added, which it is hoped will redound to its good. Bro G.A. King aided by Rev. G B Russell of Athens and Rev. Leonidas Polk of Towanda, held a series of meetings during the winter which resulted in increasing membership and interest. 29 persons were baptized and received into full membership in January. Our prospects are favorable for success. We have an attendance of 50-75. The YPEU is in a flourishing condition. Financially we are quite poor but with much zeal. It was decided to build a shed for teams which is slowly advancing. August 28th The society and all seem to be working together in harmony. Peace and quiet reigns. The spring equinox this year was mostly grey -- the trees, the skies, the earth, everything in our part of the world so very grey. There is one window I check every morning, pulling back the curtain to see if the birds are back at the birdfeeder, to see if the crocuses have made any progress. 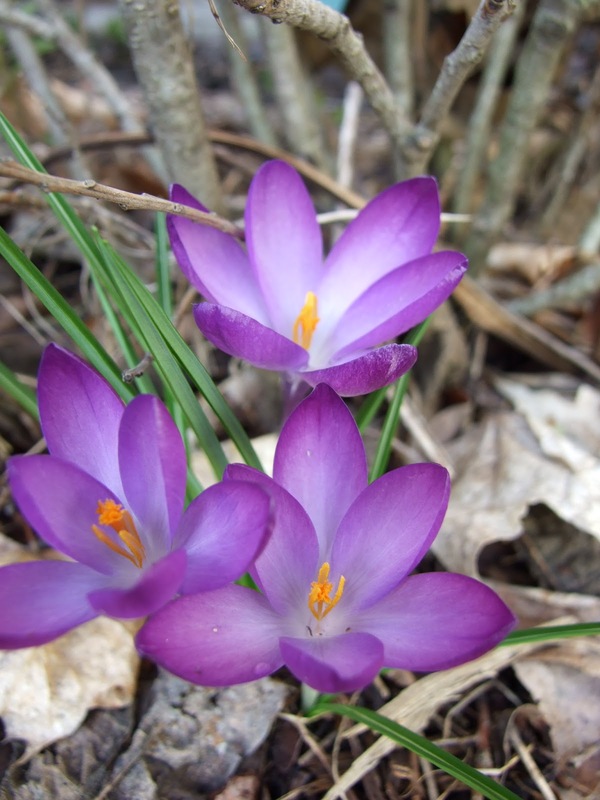 There is nothing like the tiny brave bloom of a crocus to give us hope that someday we will throw off our wool mittens and thick long coats and drink lemonade under the lush green shade of a tree. Without the crocuses, it’s hard to be hopeful when the forecast calls for another week of freezing nights and grey days. It turns out that 1877 was near the end of what is called “The Long Depression” an economic depression that effected the US and Europe and was only outdone by the “Great Depression” of the 1930s. In 1876 the unemployment rate peaked at 14%. (This Great Recession we ourselves have so recently experienced had a peak unemployment rate of only %10.) I feel for the trustee who wrote that report 136 years ago who could think of “no encouraging word.” The church was in a deep grey despair. Just 3 years later, in 1880, the history gives an exuberant description of Rose Sunday. “The church was beautifully decorated and the day was fine. All nature seemed to smile on the day set apart by the Universalist church for observing the solemn rite of baptizing our children” The church hired a new minister and put new windows in the church. Resurrection! But grey times returned: just 2 years later they despaired that “The society is dead and has not enough vitality left to get up a respectable funeral.” Then silence- we find nothing at all in our little church history until 1895 when it reads “There has been quite an awakening from the Rib Van Winkle sleep of the society.” Resurrection! This season of growth and renewal seemed to be more lasting, as the following year the leaders still felt that “Our prospects are favorable for success. We have an attendance of 50-75... Financially we are quite poor but with much zeal” And as if to help me with my sermon they noted that “Children’s Day was observed today with appropriate ceremonies. The church was handsomely decorated with evergreens and flowers.” The season of growth and blooming follows the grey season of dormancy. As you will know if you have tried to grow tulips in a more moderate climate, without the dark frozen ground of winter, the tulips cannot return in the spring. One of my dear mentors, Til Evens, who was not only a shining star of Religious Education, but also was a talented gardener. Each year after the tulips were done blooming and the leaves began to die back she would dig up all her tulips and put them in the refrigerator during their dormant season, because the winters in Santa Cruz were not harsh enough, and if the tulips were left in that warm moist soil they would not come back in the spring. One of the great spiritual truths is that you cannot skip over the dry grey season. Just as there are seasons in the natural world, there are seasons of the soul. There are many different ways of thinking about these seasons, but the controversial theologian Matthew Fox describes a four-fold path. Drawing on a mystical tradition which extends back to the 13th century mystic and teacher Meister Eckhart, he names these paths, the Via Positiva, the Via Negativa, the Via Creativa, and the Via Transformativa. It is the Via Negativa I want to talk about today. This is the time of uncertainty, of darkness, of letting go. Sometimes we think “If I were a better, more spiritual person” or “if we were a better church” then there would be no uncertain, grey times for us. But when you read the great mystics, the great spiritual teachers, they all describe dark, uncertain times. During such times it can feel like there is a palpable absence of God. Instead, Fox argues, were are seeing a different aspect of the divine, a different, but still important, aspect of the soul. For many people, these dark seasons have a feeling-tone similar to depression, and so in our culture we often medicate these symptoms. As a culture we want to rush toward spring, skimming along the surface of life, afraid of what we find in its depths. And mostly that hunger for light and growth is an instinct that serves us well. like the crocuses dying back in flower and leaf, pulling all their energy into the bulb, hidden in the dark cold earth, having faith that someday they will flower again. We have all seen what happens to plants that burst forth too soon when a late frost hardens the soil overnight. Sometimes remaining dormant and still is the wise choice. The Via Negativa is a path that requires tremendous courage and faith – faith that there is some important gift in the stillness and in the dark, even as grey week stretches into grey week. Without this quiet, dark, dormant time, Fox explains, there can be no Via Creativia – the soul’s season of rebirth and creativity. Without the dark time of the womb and the difficulty of labor, there can be no birth. Without the dark frozen winter, there are no tulips in spring. This first Sunday after the Equinox, after day has finally become longer than night, when furtive bits of green appear in the landscape for those with eyes to see, we remember resurrection. My current home in Ithaca we purchased one fall, and as far as we knew the garden beds were bare of everything but the bushes and landscaping canvas which had been put in when our hundred year old home was renovated. Imagine our amazement when first snowdrops, then crocuses, then tulips, Star of Bethlehem and great old stalks of Solomon’s seal emerged from that grey, seemingly barren soil. A whole garden lay there dormant all winter long, and not one hint showed above the ground. Both the Pagan and the Christian traditions celebrate Resurrection during this season because in the Northern hemisphere there is no more powerful argument for hope than when what looked for all the world like hopeless barren death shakes itself awake and life springs forth. And we too emerge, blinking in the sun, called back out into the world. If we have spent our dark time well, something new can be born. In 1947 the Athens congregation, called the “Church of the Universal Brotherhood, had been meeting since 1849- almost a hundred years. They no longer had enough members to maintain this building and so they sold it to the Christian Scientists for $2000. The group then met at the Sheshequin church until in 1960 when they dissolved the congregation. Imagine the heartbreak and the grief. A grey, difficult time for beloved community. The Sheshequin Congregation had struggles of their own. Because of the antiquated heating system the congregation had stopped holding services between Christmas until Easter. I asked Nell Allen, who was a committed steward of the church for many years, what she remembered of that time, and as you can imagine she said this winter hiatus made it difficult to get a good Religious Education program going for the children. Jill Worthington, who had joined the church in 1989(?) and remembers that we were renting a space in East Athens for the winter months since Sheshequin was impractical. She recalls “We had a sizable bunch of kids & they used the basement for their YRE; we used it for after services Social Hour also since it had a kitchen down there & large area with tables. Upstairs where the services were held, was a nice gathering hall. But it wasn't our own. " Athens Universalist Church has been/ returned to Unitarian Universalism. The Rededication Committee reported to the annual meeting: “A Service of Rededication was held on Saturday, September 14, 1991 at 7:30 p.m. Members of the congregation gave happily of their time and talents to clean, decorate and bake for the big event. Chrysanthemums and luminaries graced the entrance to the church; large arrangements of fresh flowers flanked the pulpit. The service, while incorporating greetings from former ministers and various denominational groups, was primarily based on the seven principles of the UUA. The Rev. Harry Thor led the service…The service was simple yet moving. An open house followed.” Resurrection! The following year the congregation added a kitchen, and our own David Porigow did the renovations. It was because of this ambitious purchase that the congregation began having an annual pledge campaign, a practice which continues to this day, even though the purchase and renovations of our building are long ago paid off. Out of despair- resurrection. Out of the sad disbanding of the Universal Brotherhood and the struggles of the Sheshequin congregation to maintain a community and their historic building through the cold dark months of winter, we – the beloved congregation gathered here today in this cozy home – we are the tulips that bloomed. Our journey as people of faith, as a beloved community is not one that avoids the path through darkness, the Via Negativa, nor do we build our homes in the dark grey places. When our journey takes us through a season of the soul that seems dry and barren, let us have the courage find the core of who we are, to find the dark home of the soul, and when spring comes as it always does, to burst forth and bloom.